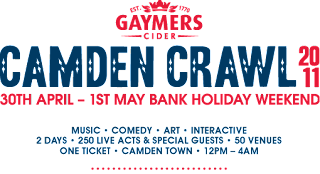 Day 1 of my first ever Camden Crawl didn't start off especially well, when I discovered there would be severe delays on my tube journey in. And then when I actually got to the HMV Forum to pick up my Crawl pass, an overzealous door person made me walk through their unwieldy queue system WHEN I WAS THE ONLY BLOODY PERSON TRYING TO GET IN. After that though, I actually had a rather splendid time. For the most part. I was wondering how exactly to write this but with time escaping me by the millisecond, you'll have to put up with a chronological structure. I apologise for its banality. And more so, the banality of my writing but you can skip all that if you like. Anyway, my musical Crawl began as I inadvertently stumbled upon Villagers soundchecking. It was like they were doing a gig just for me. That was nice. With many of the daytime fringe events already expired, my first proper stop was the Roundhouse Terrace for FG tip for 2011, Dog Is Dead. The band's joyous indie-pop was a delightful start to the Crawl, as was visiting the Terrace itself - both sparkling under the sunshine. After a brief detour to meet a friend at hipster hang-out, the Hawley Arms, we found ourselves upstairs at The Enterprise for tipped grungers Tribes. In searing heat, the band produced an impressively driven set and possibly the funniest moment of the Crawl when a fan offered a 99 with Flake (an ice cream cone - for any international readers) to the frontman mid-song. He indulged briefly before carrying on with proceedings. I abandoned my pals post-haste in a foolish/courageous attempt to squeeze in several bands in the evening. Kieran Dickens, aka DELS, was first up. Another of my tips for 2011, his performance at the Jazz Cafe suggested that my faith was not misplaced. A charismatic rapper, he was complemented by Raisa Khan (of Michachu & The Shapes) and a couple of other musicians, combining to atmospheric electro. I ran off halfway through his set to try to catch yet another FG tip for 2011, King Charles, at the Electric Ballroom. The door staff there were my least favourite out of all the venues at the Crawl. After a minor struggle, I managed to catch a clutch of King Charles songs - which had the sound guy rocking out like I'd never seen a sound guy rock out before. He wasn't alone as the ludicrous solos and prog-psych-folk-pop were lapped up by a remarkably receptive audience. I inexplicably failed to see Creep next, instead opting to see Team Ghost at the Dublin Castle - despite them playing twice again on the Sunday. In the end, it worked out pretty well, with the French band producing an intriguing blend of shoegaze and electronica. I recommended seeing electro-pop artist MNDR on the Mud Hut Digital podcast and I'm glad that I did. Awesome projected visuals and quite terrifying enthusiasm. The big surprise came when Mark Ronson (and J2K) helped MNDR deliver a smashing version of 'Bang Bang Bang'. Pity that more people weren't there to see it all go down. It was a toss up as to whether I'd go see St Etienne or Killing Joke, seeing as I had no particular love/hate for either. Geographical convenience meant I opted for the latter, and was pleasantly surprised. For probably the most "mature" band during the whole weekend, they also appeared to be one of the hungriest - shown not only in the manner in which they performed their music but the ongoing political commentary during the set. Little Comets were the footnote to the evening, and although I could barely see a thing and left after a handful of songs - I'd already learnt that they were even chirpier live than on record and undoubtedly an enjoyable way to end anyone's evening. Day 1 was a success. Especially as I managed to only spend 79p in the whole day - a bottle of Volvic, if you're interested. Read more about the 2011 Gaymers Camden Crawl at thecamdencrawl.com.